Vietnam’s national football team has been granted with USD4,000 by the Vietnamese Embassy in Laos before their first match of the AFF Suzuki Cup 2018. 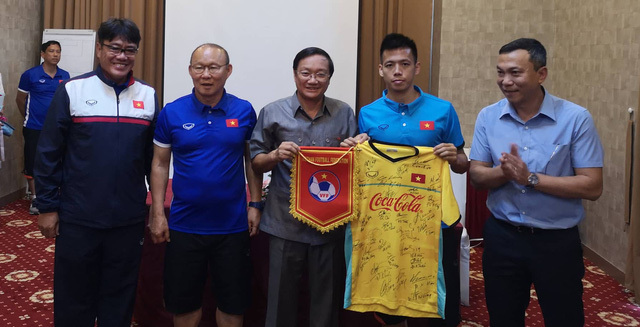 On November 6, Vietnamese Ambassador to Laos Nguyen Ba Hung visited the national team on their arrival for the AFF Suzuki Cup 2018. Ambassador Hung hailed the victories of South Korean coach Park Hang Seo and his team at the Asian Football Confederation U23 Championship and ASIAD 2018. Hung also hoped that the squad would do well. The squad are scheduled to play Laos at 7 pm on November 8. At the meeting, coach Park Hang Seo thanked the support of the Vietnamese Embassy in Laos and said the whole team would try their best to enter the final round of AFF Suzuki Cup 2018.